Proof-of-concept shows that using cyborg insects to map large disaster zones is sound. It took 48 hours after an earthquake hit Nepal for a global network of volunteers to fill in big gaps in the nation’s map for relief workers on the ground. It is crucial for first responders to know as soon as possible which roads are still passable, which patches of land can serve as helipads or drop zones, whether there are the landslides, and how many structurally sound buildings there are. Answering those questions is the goal of crisis or disaster mapping, which has become an important assist to first responders around the world. Now, a study from researchers at North Carolina State University develops insect cyborgs, or biobots, to map large, unfamiliar areas, such as collapsed buildings after a disaster. The team state that the idea would be to release a swarm of sensor-equipped biobots, such as remotely controlled cockroaches, into a collapsed building or other dangerous, unmapped area. The study is published in the journal Robotics and Autonomous Systems with video footage here. 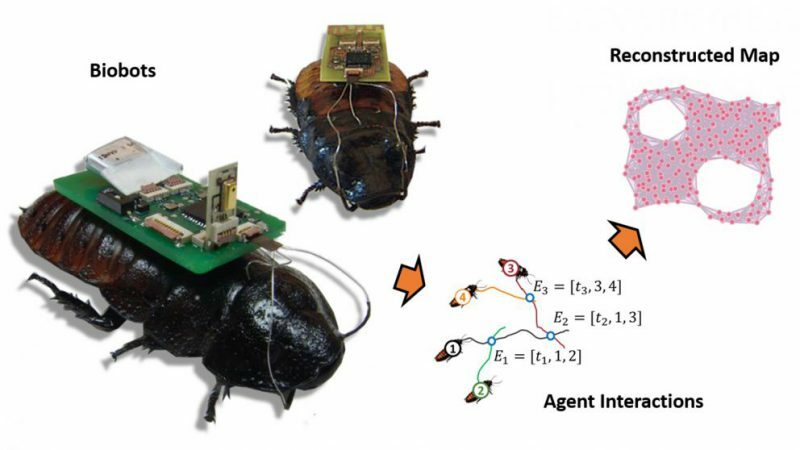 Earlier studies from the lab developed functional cockroach biobots and software which allowed them to map small areas. The group hypothesize that in a disaster scenerio the area would be defined by proximity to a beacon on unmanned aerial vehicles (UAVs). The biobots would then signal disaster teams via radio waves whenever they got close to each other; custom software would then use an algorithm to translate the biobot sensor data into a rough map of the unknown environment. The current study maps much larger areas, allowing a far more comprehensive overview using inch-and-a-half-long robots in a proof-of-concept. The current study uses inch-and-a-half-long biomimetic robots, which simulate cockroach behavior, released into a maze-like space, with the effect of the UAV beacon emulated using an overhead camera and a physical boundary attached to a moving cart. Results show that once the program receives enough data to map the defined area, the UAV moves forward to hover over an adjacent, unexplored section where the biomimetic robots move with it, and the mapping process is repeated. Data findings show that the software program then stitches the new map to the previous one. The team state that this can be repeated until the entire region or structure has been mapped, and that map could then be used by first responders or other authorities. They go on to add that their approach consists of metric estimation from coordinate-free local encounters, and topological features of the unknown environment are extracted in a robust manner; therefore, a methodology for construction of global maps from local maps is proposed. The team surmise their findings present an approach for global exploration and mapping of unknown environments using a swarm of cyborg insects, known as biobots, for emergency response scenarios under minimal sensing and localization constraints. For the future the researchers state that it would be of much more practical use for helping to locate survivors after a disaster, finding a safe way to reach survivors, or for helping responders determine how structurally safe a building may be. They conclude that the next step is to replicate these experiments using their actual cyborg insects. Researchers at North Carolina State University have developed a combination of software and hardware that will allow them to use unmanned aerial vehicles (UAVs) and insect cyborgs, or biobots, to map large, unfamiliar areas — such as collapsed buildings after a disaster. Credit: Edgar Lobaton.